We failed to spot an otter, although we did see a heron and several geese with their goslings. They may all have been loafing around somewhere, gorged on the silver mullet which had kindly migrated into their water supply. Soon after setting off, however, we stopped to admire the mountain views and caught what we chose to believe was a sea eagle swooping in the distance, and later I saw a curlew and its chick standing in a field. The road to Tobermory was narrow but well-tarmacked, and one of the nicest rides of the holiday. I was almost sorry to arrive in Tobermory, although the prettiness of the town, plus its sweet shop and distillery, made up for it. Our next stop was Fishnish, a lovely name which can be sung to the tune of Paula Abdul's 'Rush Rush', for the ferry back to the mainland. This was to be a day of three ferries. The second made the short journey to and from Corran at twenty-minute intervals, so we watched it ply up and down while having lunch at the pub opposite the tiny dock. When we had finished, we waited for it to come within range before kitting up and rolling straight from the pub car park onto the ramp. The next road was the A82 through Glencoe, a fast and swooping route through magnificent mountain views. I went ahead with Howard, planning to stop in a layby and take photos of the others as they arrived, but I was having too much fun couldn't find a suitable layby. 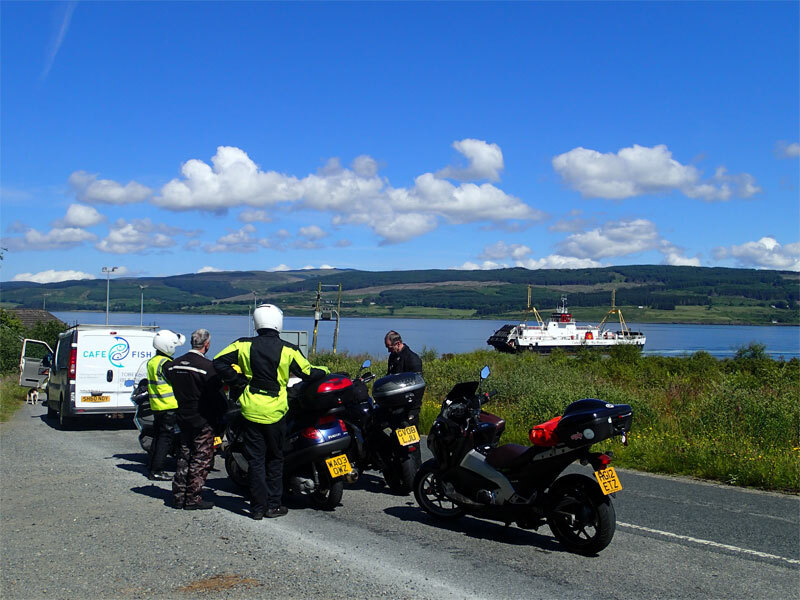 When the group had reassembled at a petrol station outside Tarbet, we pushed on to our third ferry of the day, which would take us to the Isle of Bute. A pretty early-evening ride along the coast, with the promise of a meal and a bed at the end of it; what could be better? We received a friendly welcome at the Howard's Way B&B and enjoyed our meal outside (Howard and I shared a bucket of profiteroles for pudding). A brief stroll to see what Rothesay had to offer (answer: lots of pubs), and an early night. Ice cream of the day: Irn-Bru, at the petrol station. I adore the photo with the beautifully pastel-painted houses! I didn't realise Tobermory was Balamory, but duh, of course it is! Was the third ferry Wemyss Bay to Rothesay, or Colintraive to Rhubodach? The latter - we rode round to Rothesay, then took the ferry from there the next morning. Aww! It certainly seemed like a lovely place - might be less so in winter, mind. Weather's a big influence. The west is great when it's sunny - or misty if you're in the mood for it - but the frequent damp weather and midges can get you down. Those are two big reasons why I live on the east coast now. I fondly recall my own visit to Tobermory and the distillery - beautiful place, isn't it? I would have liked to do the tour, but there wasn't time. I was a bit miffed to be shooed out of a display I was looking at because it was supposed to be the climax of the tour! I've only done the Lochaline-Fishnish ferry once (well, twice: it was a return trip!) but I enjoyed it. I remember passing a pleasant half-hour waiting for the ferry watching the birds (mostly chaffinches and siskins) on the feeder at Fishnish. Though, and I speak from experience (albeit as a passenger) not much fun to do after dark in the rain! It's remarkable how different Glencoe looks in the sunshine. Thoroughly agreed about the views, though. One for my "one day" list, that! Buckets of profiteroles and Irn-Bru ice cream? Heaven!